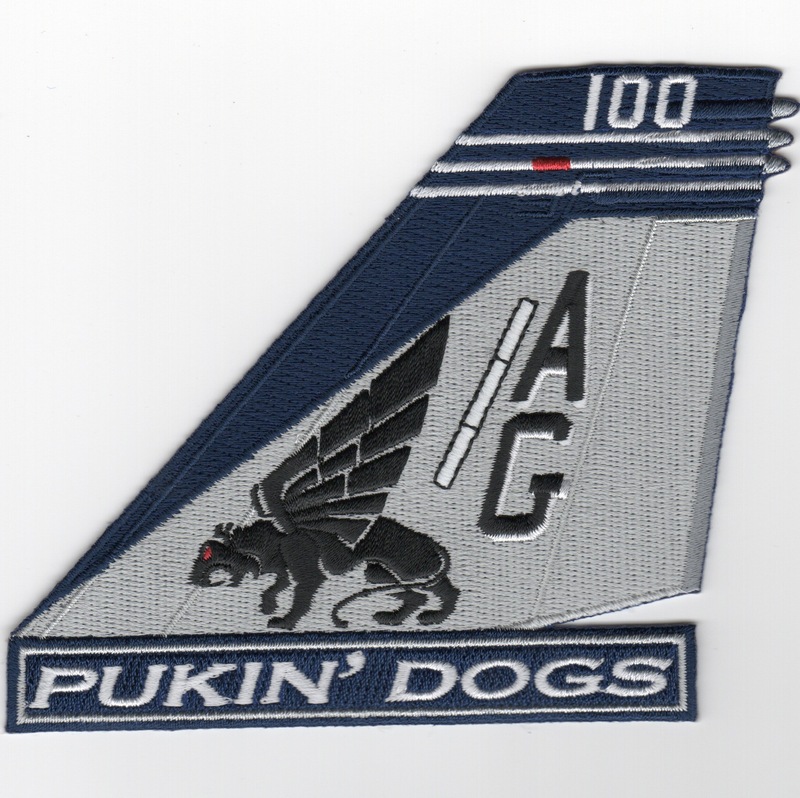 This is the gray/dark blue version of the F/A-18 tailfin created for the VFA-143 PUKIN' DOGS. This patch does not come with velcro attached. This is the official colors of the squadron. 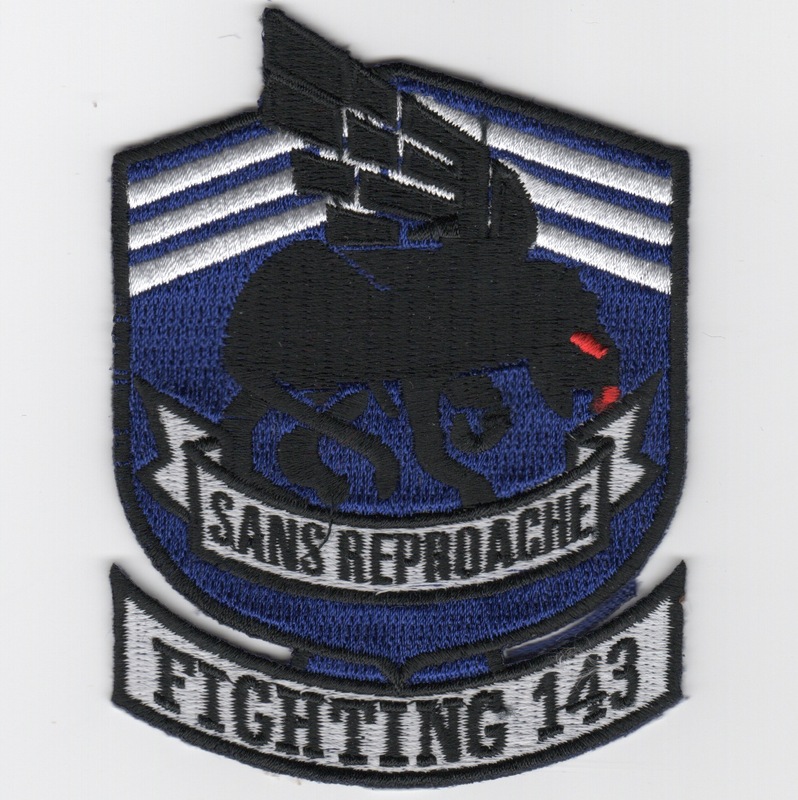 This is one of the 2016 OIR cruise patches for CVN-75/VFA-143/CVW-7 showing a black scorpion over Iraq. It has the "gaggle" of squadron emblems around the edges and says "BIGGER BOMBS, MORE TONNAGE, LONGER LASTING" along the top with "EXTENZE" at the very top, and is "blue", the same color as "that little blue pill". Working with VFA-143, we bought ALL their older cruise patches to help their "Mess". Very detailed patch, pretty neat idea of "breaking the glass". This patch does not have velcro attached. 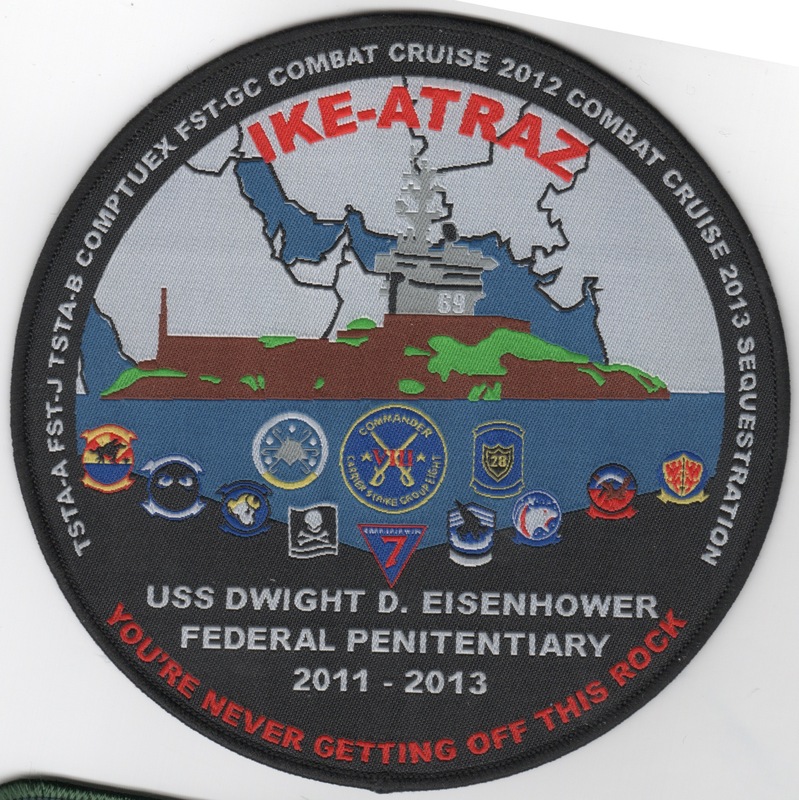 This is one of the cruise patches created by USS Eisenhower (CVN-69), VFA-143 and Airwing 7 that shows all the insignias of the Airwing's squadrons and says "IKE-ATRAZ" across the top and "YOU'RE NEVER GETTING OFF THIS ROCK" across the bottom with all the squadrons insignia shown. Working with VFA-143, we bought ALL their older cruise patches to help their "Mess". Yet another very detailed patch, and does not come with velcro attached. 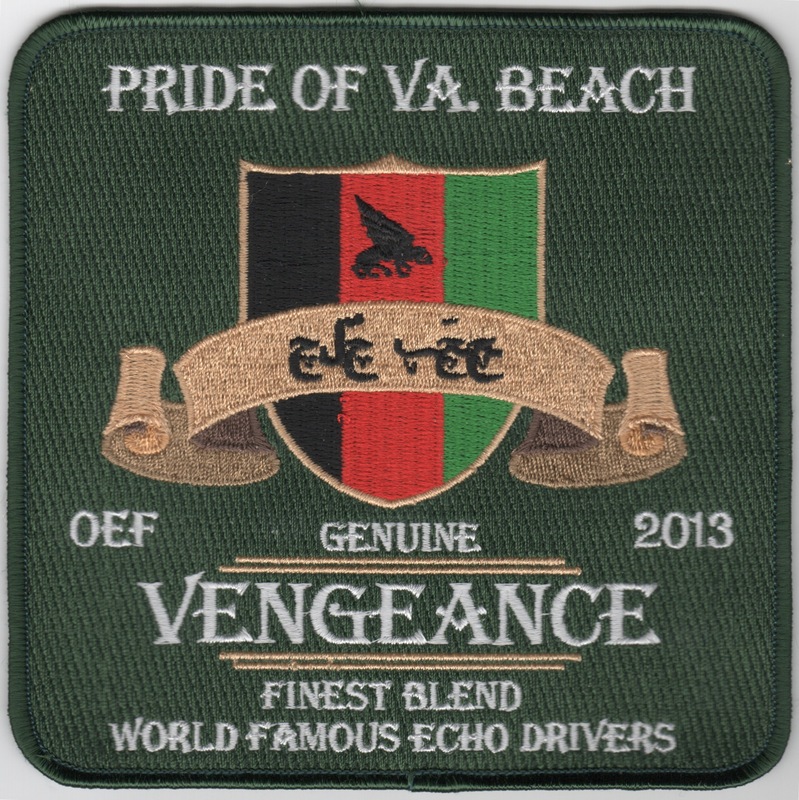 This is one of the cruise patches created by USS Eisenhower (CVN-69), VFA-143 and Airwing 7 that says "PRIDE OF VA. BEACH" across the top and "VENGEANCE" along the bottom. There is a black/red/green shield with the VFA-143 mascot and a gold scroll with (what looks like) arabic writing. I don't have all the details of this patch. Working with VFA-143, we bought ALL their older cruise patches to help their "Mess". Yet another very detailed patch, and does not come with velcro attached. 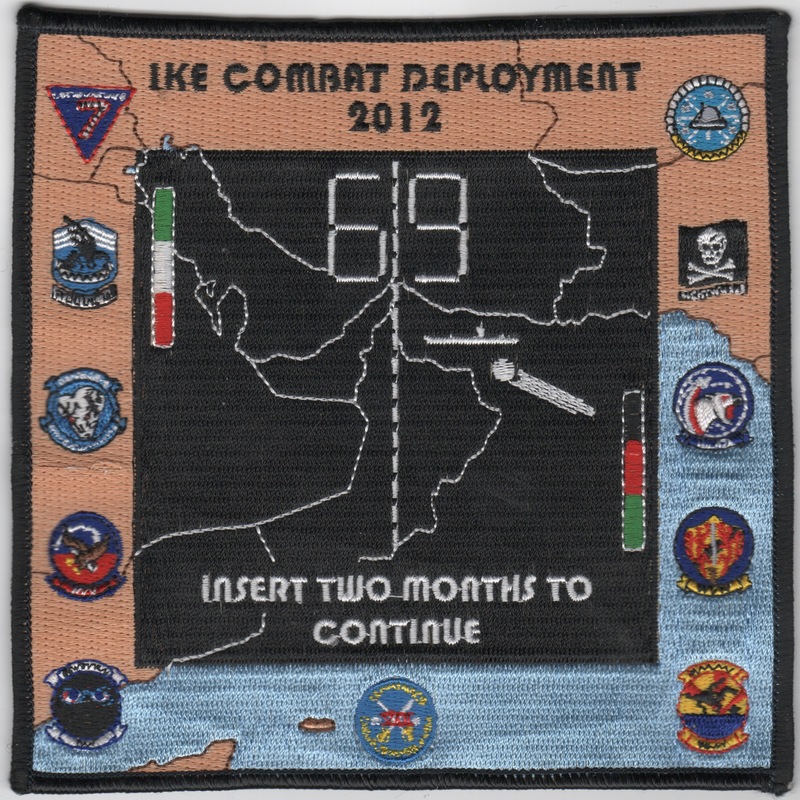 This is one of the cruise patches created by USS Eisenhower (CVN-69), VFA-143 and Airwing 7 that shows all the insignias of the Airwing's squadrons and says "IKE COMBAT DEPLOYMENT 2012" across the top and "INSERT TWO MONTHS TO CONTINUE" across the bottom. Working with VFA-143, we bought ALL their older cruise patches to help their "Mess". Yet another very detailed patch, and does not come with velcro attached. 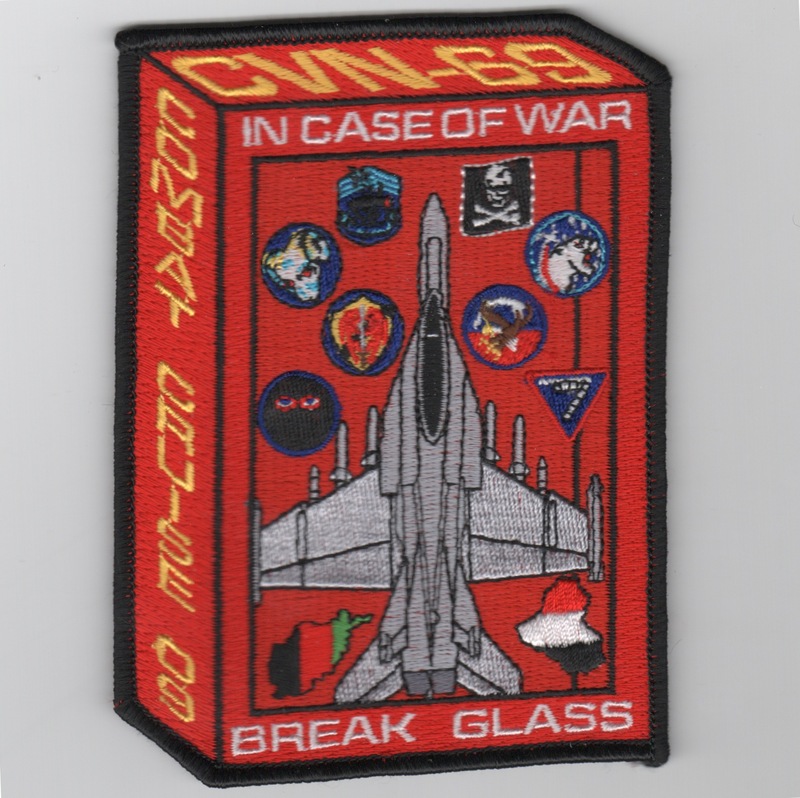 This is one of the cruise patches created by the USS Eisenhower (CVN-69)/VFA-143/CVW-7 folks for their 2009 Cruise Patch. In support of OEF/OIF, this patch shows the various squadrons of Airwing 7 and says "COMBAT CRUISE 09" along the left side, "IN CASE OF WAR" across the top, and "BREAK GLASS" on the bottom. 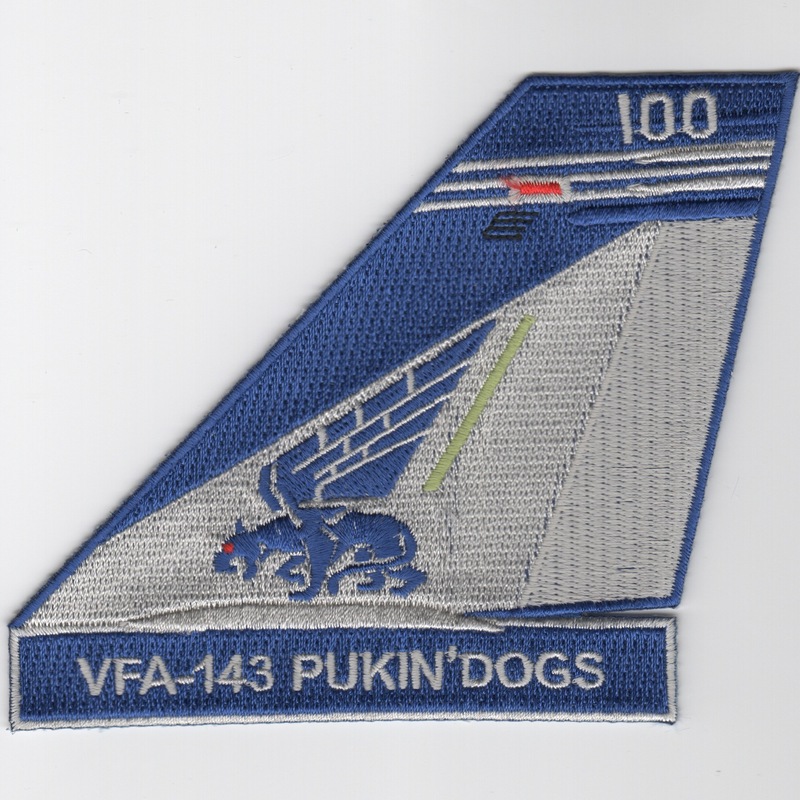 Working with VFA-143, we bought ALL their older cruise patches to help their "Mess". Very detailed patch, pretty neat idea of "breaking the glass". This patch does not have velcro attached. These are the color version of the nametags for the pilots for VFA-143. These are the color versions of the nametags for the WSOs for VFA-143. These are the desert version of the nametags for the pilots for VFA-143. These are the desert versions of the nametags for the WSOs for VFA-143. The 'Pukin Dogs' of VF-143 began existance as VF-871, a Reserve squadron activated for the Korean War in July 1950. They flew F-4J Phantoms until 1974 when they transitioned to the F-14A Tomcat, but currently are flying the F/A-18 Hornet. They made their first Tomcat cruise aboard the USS America (CV-66) in April 1976. They transitioned to several carriers, but remained with the same battlegroup/CVW and was paired with VF-142 before their decommissioning. This patch shows the "Red Eyes" of the mascot. The 'Pukin Dogs' of VF-143 began existance as VF-871, a Reserve squadron activated for the Korean War in July 1950. They flew F-4J Phantoms until 1974 when they transitioned to the F-14A Tomcat, but currently are flying the F/A-18 Hornet. They made their first Tomcat cruise aboard the USS America (CV-66) in April 1976. They transitioned to several carriers, but remained with the same battlegroup/CVW and was paired with VF-142 before their decommissioning. This patch shows the "Black Eyes" of the mascot. The 'Pukin Dogs' of VF-143 began existance as VF-871, a Reserve squadron activated for the Korean War in July 1950. They flew F-4J Phantoms until 1974 when they transitioned to the F-14A Tomcat. They made their first Tomcat cruise aboard the USS America (CV-66) in April 1976. They transitioned to several carriers, but remained with the same battlegroup/CVW and was paired with VF-142 before their decommissioning. They are currently paired with VF-11 in CVW-7. This is the desert version of the squadron patch they wear when over in the "Box" (Persian Gulf). The 'Pukin Dogs' of VFA-143 began existance as VF-871, a Reserve squadron activated for the Korean War in July 1950. They flew F-4J Phantoms until 1974 when they transitioned to the F-14A Tomcat, then transitioned to the F/A-18F in 2005. They made their first Tomcat cruise aboard the USS America (CV-66) in April 1976. This is their new black-bordered Hornet "transition from" Tomcat patch. The 'Pukin Dogs' of VFA-143 began existance as VF-871, a Reserve squadron activated for the Korean War in July 1950. They flew F-4J Phantoms until 1974 when they transitioned to the F-14A Tomcat, then transitioned to the F/A-18F in 2005. They made their first Tomcat cruise aboard the USS America (CV-66) in April 1976. This is their new white-bordered Hornet "oval" patch. The 'Pukin Dogs' of VFA-143 began existance as VF-871, a Reserve squadron activated for the Korean War in July 1950. They flew F-4J Phantoms until 1974 when they transitioned to the F-14A Tomcat, then transitioned to the F/A-18F in 2005. They made their first Tomcat cruise aboard the USS America (CV-66) in April 1976. This is their new black-bordered Hornet "oval" patch. The 'Pukin Dogs' of VFA-143 began existance as VF-871, a Reserve squadron activated for the Korean War in July 1950. They flew F-4J Phantoms until 1974 when they transitioned to the F-14A Tomcat, then transitioned to the F/A-18F in 2005. They made their first Tomcat cruise aboard the USS America (CV-66) in April 1976. This is their new white-bordered Hornet aircraft diamond patch. The 'Pukin Dogs' of VFA-143 began existance as VF-871, a Reserve squadron activated for the Korean War in July 1950. They flew F-4J Phantoms until 1974 when they transitioned to the F-14A Tomcat, then transitioned to the F/A-18F in 2005. They made their first Tomcat cruise aboard the USS America (CV-66) in April 1976. This is their new black-bordered Hornet aircraft diamond patch. 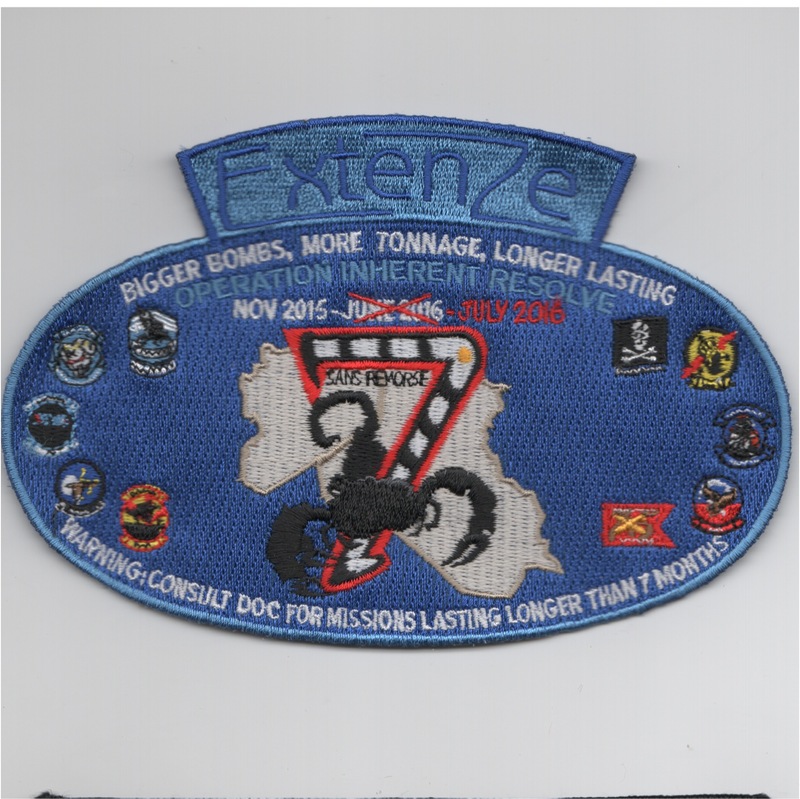 Homepage | Order VFA-143 Patches!